Air Blast Machine utilizes Glass Beads for quickly cleaning and prepping the surfaces of metal parts without significant metal removal. 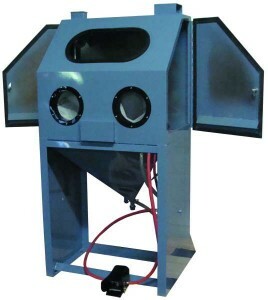 This process utilizes air to propel the blast media onto a part. Machine styles include automated systems, manual cabinet systems, and even entire blast rooms. The model GB 2032 ‘s space saving design offers maximum versatility and simplicity to enable an operator to perform dozens of different cleaning and finishing operations efficiently and easily.